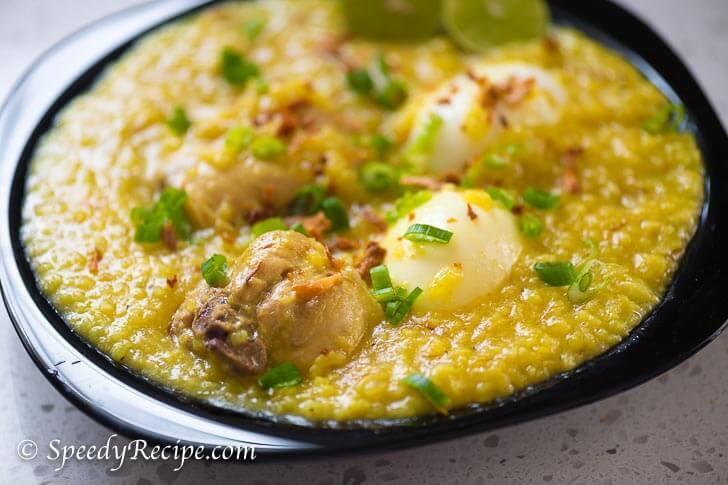 Chicken Arroz Caldo is a type of rice porridge. It is a popular dish in the Philippines and is usually eaten for breakfast or as a heavy snack during mid-afternoon. It is great to have during a cold day because it can make you feel warm and comfy. I also like to have it on rainy days wherein there is nothing much to do. Simply pull a chair and watch the raindrops go by as you enjoy your warm arroz caldo – then take a nap afterwards. That is the life! Unfortunately, it is all wishful thinking because there is always tons of work and unending chores that needs to be done. This is perfect to make during wintertime here in Chicago. The winter season here should not be taken lightly; aside from the regular freezing temperature, we also get strong winds, which earned the city its nickname: the windy city. I can always use a warm bowl after getting home from a fruitful day at work. It is even better if there is a piece of boiled egg or two in my bowl – sprinkle some toasted garlic and chopped scallions on top and squeeze a generous amount of lemon. Yum! Here is how I cooked arroz caldo. Start by frying the garlic until it gets golden brown. Do this by heating the oil in the pot. You should add the garlic while the oil is still starting to get hot to prevent it from cooking quickly. This technique will ensure that the garlic is cooked evenly. Remove the garlic from the pot once it gets golden brown. Continue by sauteeing the onion and ginger using the remaining oil — also add the ground black pepper at this point. The chicken should be added once the onion gets soft. You will need to cook the chicken while stirring until the outer part turns light brown in color. Once this happens, put the rice in pot. I used Jasmine rice for this recipe, Give it a quick stir and then pour chicken broth in the pot and let it boil. At this point, you want to adjust the heat to medium. Continue to cook until the rice completely absorbs the liquid. The safflower, which is called “kasubha” in Filipino needs to be added next. This is basically dried flower of the safflower plant. It give the rice porridge it yellow color. In addition, I also used a bit of saffron for this recipe. I like to use it because it makes my arroz caldo taste and smell better. At this stage, you should continue to cook this until the texture resembles a porridge, which is somewhat mushy. I used fish sauce as seasoning and it always taste superb when topped with a generous amount of toasted garlic. This is the garlic that I cooked earlier in the process. Don’t forget to add an egg and chopped scallions. 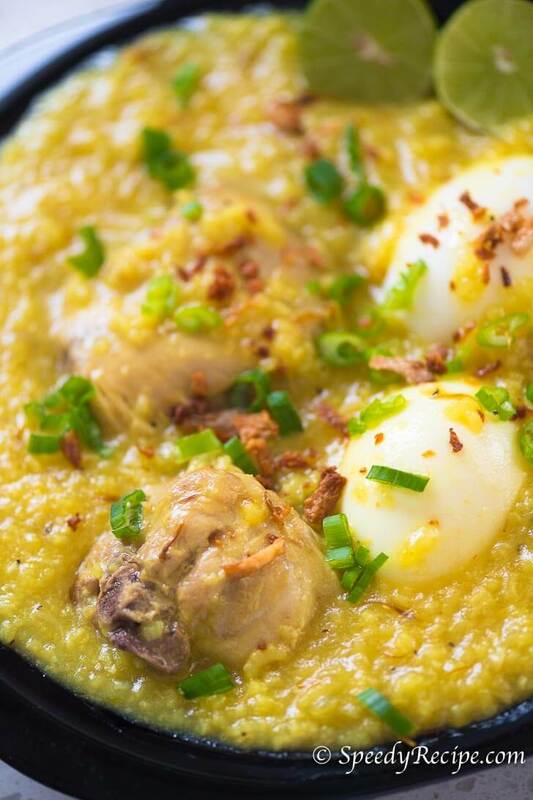 Enjoy this warm and comforting chicken arroz caldo recipe. Enjoy! Add the garlic right away. Stir and continue to cook the garlic in medium heat until it gets golden brown. Scoop the garlic out of the pot and then set aside. Add ginger, onion, and ground black pepper into the pot. Cook until the onion becomes tender. Put the chicken slices into the pot. Cook until the chicken turns light brown. Pour the rice into the pot and then stir. Cook for 2 minutes. Cover the pot and set the heat to medium. Continue to cook for 35 minutes while stirring once in awhile. Add the safflower (kasubha) and saffron. Stir. Cook for 5 minutes or until a porridge-like texture is achieved; you can add more chicken broth or water if needed. Stir-in the fish sauce. Continue to cook for 2 minutes more. Transfer to as bowl. Add the boiled egg and then top with fried garlic and green onions. Squeeze lemon on top. Enjoy! Very well written step by step instructions! And a very well English diction! Will definitely look into your other menus! Thank you!